Invoking the scribes. Of Ancient Egypt. Authors: Normadi Ellis and Gloria Taylor Brown. A very interesting book on spiritual journaling. 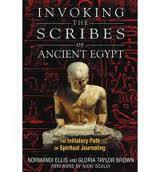 It is a cruise of a group of spiritual writers who follow the path of the original keepers of the sacred stories. Each of us have a story, some heroic efforts, some losses, these are the sacred stories that have to be told, and this was done by the scribes of Egypt. They were the technicians of documenting the sacred masters of hieroglyphics thinking, in proper sequence, intonation and proper intent. There were able to create through words and thoughts the pilgrims of the word travel have attempt to practise this form of journaling. Their insights, their breakthroughs, their transformation and learning all documented as the authors take us through their internal self journey while anchoring it on external landmarks of Egypt. Previous PostPrevious To perfect Divahood. Next PostNext Much Ado about something.